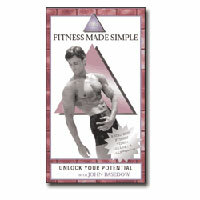 FITNESS MADE SIMPLE highlights the personal training and nutrition program of fitness celebrity John Basedow. Over the past few years out of nowhere, John has burst onto the fitness scene appearing in many national and regional exercise and bodybuilding related publications...an outstanding accomplishment he attributes all to the basic result producing, muscle building, and fat burning program he discusses on this tape. Whether you’re just beginning to get into fitness or even if you’ve reached a stumbling block in your current routine, FITNESS MADE SIMPLE is for you.